Crispy, crunchy, and satiating dry fruits surely are one of the most loved tidbits. Be it for gifting your loved ones on festivals or munching them in the middle of the night -- these little delights are perfect for every occasion. Although it is easy to procure dry fruits from any part of the country -- Kashmiri dry fruits have made their own place in everyone’s heart. Produced through organic methods and accrued from some of the well-known manufacturers and sellers of Kashmir -- this extensive range of Kashmir dry fruits has been made available to you, only on SaleBhai. To provide you nothing but the best options -- we have curated this list of top 5 best-selling dry fruits from Kashmir. Navigate through these dry fruits from Kashmir and make your purchase. You will want to thank us for sure. Whether it is about using them as ingredients to prepare delicious kheer for dessert or munching them early in the morning -- almonds are one of the most popular and beneficial dry fruits. Despite being rich in fat, they are still preferred by many. The nutrients that they carry provide a myriad of health benefits. They are believed to give us relief from brain as well as heart disorders, respiratory problems, coughs, diabetes, constipation, anaemia, and even impotency. With so many advantages, it’s no wonder almonds are a must in our daily diet. At SaleBhai, we have a variety of almonds, procured from some of the famous vendors of Kashmir. Relish our California Almond Jumbo Plain from Nutraj Signature or Premium Almonds from Pure Mart - we have a lot of options in our basket. Considering the health benefits and great taste offered by almonds, there are several recipes that you can prepare with Kashmiri almonds. Famous chef Sanjeev Kapoor's recipe of thick almond soup can be prepared in minutes and served to your loved ones any time of the day. A significant look-alike of the human brain -- walnuts have earned the second position on our list. 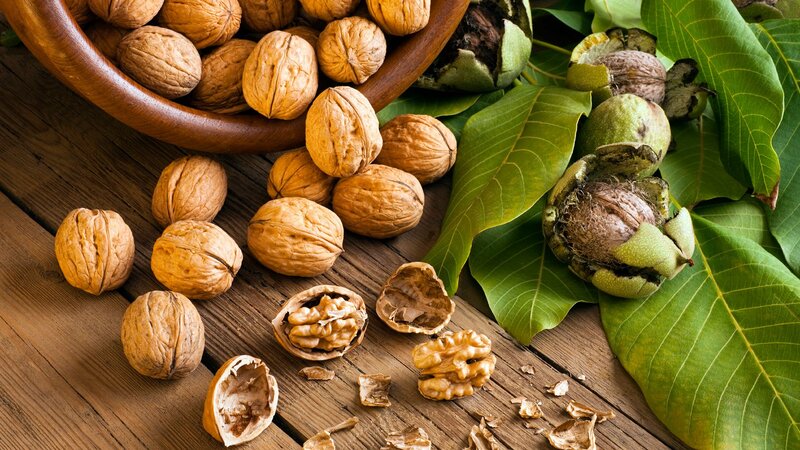 Famously known as akhrot, walnuts are one of the most preferred dry fruits since they are considered amazing for skin and hair. We love walnuts -- be it in chocolates, cookies, cakes, or any other dessert. We have procured the best quality of walnuts from Kashmir. For those who are pressed for time or cannot bring themselves to crack open a walnut shell -- we have Walnut Kernels from Nutraj Signature. For the more adventurous ones, we have our selected pack of California walnuts (in shell). Undoubtedly, there are several dishes that can be prepared with walnuts. But, did you ever think you could make akhrot kebabs? No right? Famous chef Ranveer Brar shows you how to make these delicious kebabs using walnuts. Check out the recipe mentioned below. A major production in India, Nigeria, Vietnam, and Ivory Coast -- cashews or kaju are consumed all around the world joyously. Available in different varieties, this dry fruit rules the hearts like a king. Can you resist anything that has a scrumptious presence of cashews? We bet not! For instance, everyone loves kaju katli. Period. When it comes to procuring bestselling cashews from Kashmir, we surely have a lot of options for you. You can purchase Chocofarm Cashews by Ultimate Confectionery or make your way towards something crispy and crunchy by selecting Roasted & Salted Cashews by Dayal Dry Fruits. Now, if you are wondering what all you can prepare with cashews, we have brought an amazing recipe of kaju kothimbir vadi by none other than Vikas Khanna. Read on. Nut of the hazel, hazelnut, is also famous as cobnut or filbert nut. Generally, this dry fruit is used to prepare several delicacies such as chocolate truffles and nutella. Yummy! Doesn’t it make you drool? It surely does! On popular demand, we present our bestselling Turkish Hazelnut by VKC Nuts. Whether you relish it just like that or add in a dessert - these tidbits serve maximum amount of satisfaction to the tastebuds. If you are looking to prepare something quick and healthy for your loved ones, here is Mascarpone Choco Hazelnut Sandwich by Kunal Kapoor. Last but not the least, a delicious dry fruit from Kashmir which is making its appearance on our list is fig. Also known as anjeer, you can devour them either dry or fresh. Along with a sweet taste, they surely provide innumerable health benefits. Since they are rich in fibre, calcium, iron, potassium, and other nutrients -- these small little pieces are perfect to munch, regardless of the time. With a wide variety of figs, SaleBhai never goes short of satisfying its customers. We have an extensive range of bestselling figs with long-lasting shelf-lives. Try Dry Figs from Pure Mart. Considering the benefits of figs, have you ever tried to make any delicious recipe with them? How about if we say you can prepare a kulfi? Yes, that’s absolutely right! Tarla Dalal shows you how it is done. When it comes to ways to devour dry fruits, we Indians do not leave any stone unturned. Be it gifting a decorated tray of the goodies to someone or stocking them in the house for sudden hunger-pangs -- dry fruits have always come to our rescue. And in case you are thinking that it would be difficult to purchase dry fruits all the way from Kashmir, think again! SaleBhai brings the best of them to you, right to your doorsteps!